I didn't make the mistake of reading reviews before watching this so I went in with no expectations. 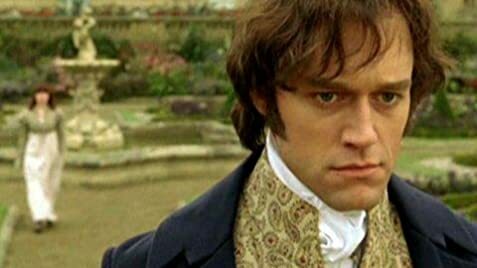 Before going any further I have to admit to having watched the 90's version of P & P and read the novel dozens of times. A true Austen freak, I am. Like other reviewers, at first I was offended by the crudeness and lack of tact displayed by the Amanda character when she entered the world of the novel. How dare any true Austen fan behave in a way that displays such ignorance of Lizzie's world? She should have fit right in. But then I realized the choice to NOT make Amanda a perfect Eliza Bennet clone made for a much more dynamic story and more amusing moments between the characters. Instead of giving her the perfect accent, the perfect deportment, and the perfect manners right from the start, it took her some time to fit in. Her clumsy manner and bluntness caused her to make some mistakes that would seem impossible for a true Austen fan but enabled unexpected twists and turns in the story. And its these twists and the what ifs that I loved. I loved that the wrong people fell in love. I love that everything she thought was supposed to happen didn't happen. If I wanted to watch a P & P imitation, I would just watch the real thing again. I found the movie Becoming Jane, which attempted to follow a truer Jane Austen style, to be a sappy and insipid imitation that was truly forgettable and predictable. No one else can do Jane Austen and Lost in Austen doesn't try to. Instead, its fun and impertinent in a way that I think Jane herself would appreciate. The gold evening gown with short sleeves worn by Christina Cole (Caroline Bingley) to the Meryton Assembly Ball is the same costume worn by Jackie Smith-Wood (Mary Crawford) to Fanny's ball in Mansfield Park (1983). Amanda Price: Collins. On the page, OK, he's pretty bad. In the flesh, he's all-time king of the mingers! When Mrs. Bennet and the girls' carriage has broken down, just as Wickam arrives, you can see a airplane or helicopter in the distant sky over Mrs. Bennet's head.